If I had to give up all but five books in my room, which ones would I keep? This happens to be one of the toughest questions of my life. This post will probably take me a hour plus to write. Book #2. Well, after searching through all my book piles I'd have to say....Squashed by Joan Bauer. I got this book from one of my Aunts (most likely my Aunt Julie) and have enjoyed it over the years. I've read it two and a half times. (xD) Just like To Kill A Mockingbird I'm still not sure what I like about the book so much. The writing is wonderful. (I've heard Joan Bauer has other great books.) I think one reason I admire this book is how the reader is easily able to connect with Ellie, the main character. (I find it funny that Joan Bauer chose Ellie to be the girls name because I have a friend named Ellie Bauer. Sorry, I just had to share that.) She's a regular teenage girl with a interesting hobby. I think I'd like her if I really got to meet her. Anyway, it would be: The Young Unicorns by Madeleine L'Engle. Although I haven't read it in a while, I've always loved this book. I think this one I've read one and a half times. I'm not in awe of it like I use to be, but I like the clever idea so much. I wish I was like Mo or Maggie, surrounded by books all the time and able to speak them out. Lucky dogs. Finally! The last book I will save! Ummmmmmm. Once again I'm going to rummage through my room. I got it! Book #5. 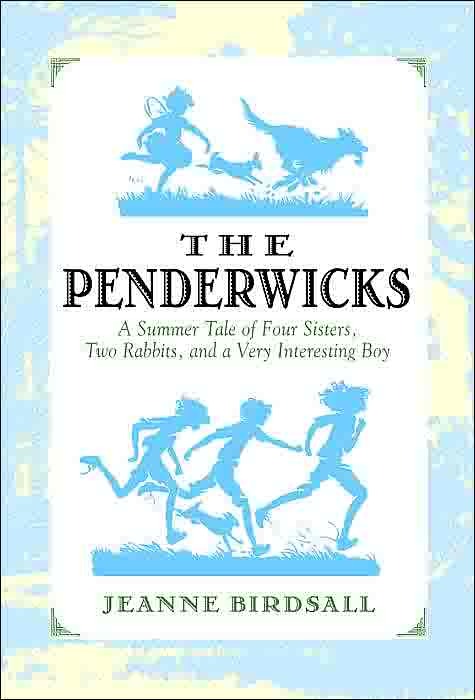 The Penderwicks (there is no link because Amazon wouldn't load...) by Jeanne Birdsail. It's directed more towards 10, 11, 12 year olds (or somewhere around there), it's still a personal favorite, along with the second book, but I can't take them both. My mom and I read this book together and loved it. Skye was my favorite character, even though she loved math. So, yeah. Pretty beast book right here. So, I think I'm going to tag people because I'm interested in what books they would save. The Penderwicks and Inkheart were both GREAT. Hannah- Yeah! I haven't read them in ages!